As cotton prices tumbled some 50% in just four months amid falling worldwide demand, the Indian textile sector is finding itself in the odd situation of having to pay more for cotton domestically than prevailing worldwide prices, thanks to the minimum support price, or MSP, fixed by the government for buying cotton from farmers. Seven ginning associations, spread across Haryana, Maharashtra, Punjab, Gujarat, Andhra Pradesh, Karnataka and Madhya Pradesh, have called for a two-day strike this week, starting 25 November. A recent, largely political, move to hike cotton’s MSP will benefit nearly 4.5 million farmers but cotton ginners, who deseed the raw cotton before the commodity is sold to textile mills, and who employ some two million, are complaining that they simply can’t buy at that price and then sell at a profitable level. Meanwhile, international prices have fallen from a high of 90 cents per pound of cotton four months ago to 40 cents. Friday, a pound of cotton sold at 40.3 cents at the New York-based NYBOT Futures. While the physical purchase rate stood at 53 cents a pound, translating into Rs2,500 a quintal, this is still lower than the average domestic rate of Rs2,650 a quintal. Saurin Parikh, secretary of the All Gujarat Cotton Ginners Association, said the price distortion will lead to higher imports, which will eventually adversely affect ginners as only deseeded cotton is traded internationally. “Already, two million bales of cotton have entered the country from Tanzania and Pakistan," he claimed. India is the largest cotton grower after China, and became a net exporter of cotton after the introduction of Bt cotton seeds, a hugely successful genetically modified variety developed by US biotechnology company Monsanto Co. Thanks primarily to Bt cotton, domestic output is expected to touch a record 33 million bales (one bale is equal to 170kg), according to government data. Last year, Indian cotton prices were cheaper than the international rate, leading to large-scale exports and several textile association lodging complaints about depleting raw material stocks. The government took steps to free imports and scrap export incentives in July. Last year, 18 million bales worth Rs15,000 crore was exported. According to the Confederation of Indian Textile Industry, it is unprofitable for companies to import cotton, when delivery takes at least two months. “We have a situation where there is a scarcity in times of plenty," said T.K. Nair, the secretary general of the association that is asking the government to lower bank rates to 7% and extend repayment period from four months to nine. According to the textile ministry, the Cotton Corp. of India, or CCI, which is entrusted to buy cotton from farmers, has already collected 1.03 million bales out of the 3.95 million bales that arrived in the market since the start of the harvest season early October. “While CCI is mandated to collect one-third of the total produce, we are close to procuring 50% of that amount," said a textile ministry official who didn’t want to be named. 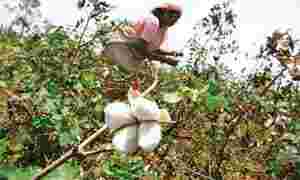 CCI has a total budget of Rs16,000 crore to lift the cotton, of which the government is expected to cover the loss, the official said. Hyderabad-based Consortium of Indian Farmers Association, a farmers’ lobby, said fixing the MSP is a way to ensure that a million farmers are assured of a reasonable profit. “The government has been pampering the industries sector with tax incentives and tax holidays while agricultural growth has remained stagnant," said Chengal Reddy, secretary general of the association. “Either farmers must be given the freedom to market their products or given a profitable price."